The Remington 700 Muzzleloader was introduced in 1996, discontinued in 2004. Throughout its decade-long run it was available in .45, .50, and .54 caliber. The owners manual is available at http://www.remington.com/products/archived/black-powder/model-700-muzzleloaders.aspx . I tested two of them and at that juncture, they had already moved from the #11 percussion cap ignition to the three-way genre of ignition: #11 caps, musket caps, and 209 shotshell primer ignition. They were filthy scope-burners and face-burners, spewing scope-baking fire all over the place. 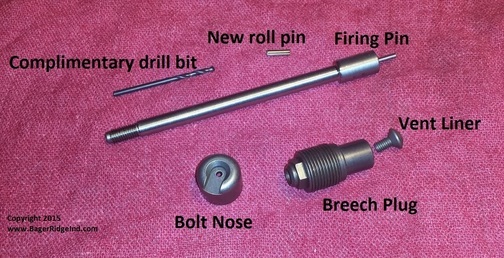 It was common, at the time, for the Ruger 77/RSO started out with percussion caps, eventually a musket cap breechplug was made available, but the rifle was discontinued before it made it to 209 ignition. Triple Se7en pellets and then Blackhorn 209 are for 209 ignition systems only and the “open” ignition systems are not suitable for Blackhorn 209. Badger Ridge Industries offers a bolt and breechplug upgrade, essentially adding the Savage 10ML-II system to the Remington 700 muzzleloader. Badger Ridge Industries is at http://www.BadgerRidgeInd.com . Badger Industries sent along an upgraded Remington 700ML to evaluate with Blackhorn 209. Using the new easy-loading Federal Premium® Trophy Copper Muzzleloader 270 grain Bore-Lokt non-discarding sabot projectiles and 100 grains by volume (70 grains by actual weight) of Blackhorn 209, the first shot was a hang-fire. The second shot was a miserable blooper, with neither of the shots making it to the paper. Power Belts would likely be even a worse choice. The Remington 700ML barrels tend to be on the loose side, compared to the infamously “tight barreled Thompson's” and so forth. I switched to sabots, using the “Nosler Muzzleloading Bullets,” the 50 Caliber 300 Grain Ballistic Tip .458 projectiles that come with MMP .458 / 50 orange sabots. They loaded firmly, yet smoothly, and ignition was now instantaneous. I used Winchester W209 primers and there was no swabbing between shots. If you did want to use the Federal Bore-Lokt projectiles, Triple Se7en FFg loose powder would be the propellant to try. Anyway, the first shot was to the right of the bull, the next two shots made one hole and the fourth shot was a bit to the right, forming a three-shot group that measured just under 1-1/2 inches center to center. The shooting was done at 100 yards with a supplied Weaver Classic 4x fixed power scope. The Badger kit cleans up the Remington 700ML, with no chance of scope burning, and brings new life to the older Remington 700ML. It works as described and if you have a Remington 700ML or can find a deal on one, consider this ignition kit a mandatory upgrade.